Out of all the incredible resources the Earth contains, trees are some of the most valuable. The oceans provide us land-dwellers with some 70 percent of the oxygen we breathe, but trees make up the rest. Vast “carbon sinks” such as the Amazon rainforest are helping to mitigate some of the worst effects of human-induced climate change, by absorbing large amounts of greenhouse gases such as methane and carbon dioxide. The world’s forests provide food, shelter and homes for thousands of human communities all over the world, in addition to countless wildlife species. Sadly, the human quest for progress and advancement – which largely appears to have been based on consuming as many of the Earth’s resources as possible – has taken an enormous toll on these vital ecosystems. 7.5 billion virgin forests once covered the planet, but since we arrived on the scene, nearly half of them have disappeared. Greenpeace International has estimated that out of all the deforestation humans have brought about over the last 10,000 years, 25 percent of it has occurred during the past three decades alone. Largely as a result of this, the planet’s wildlife numbers have declined by 52 percent over the last forty years. 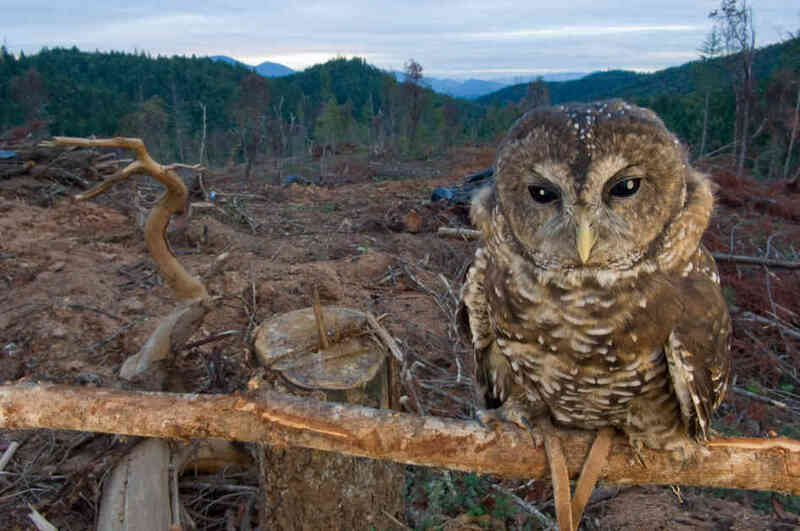 When we seek to improve our quality of life by cutting down as many trees as we like, we tend to forget that for the animals who depend on them for sustenance – such as this owl – they are more than just materials. We also fail to recognize that by destroying these precious, life-sustaining ecosystems, we are ultimately destroying ourselves. Around 80 percent of deforestation in the Amazon rainforest is driven by beef production, as an estimated 2,000 trees are cleared every minute in order to make way for cattle ranches. The world’s second-largest rainforest, the Congo in Central Africa, has also come under threat as a result of commercial logging, agriculture, road building, and civil strife in the Democratic Republic of Congo (DRC), in which two-thirds of the forest is located. Indonesia’s vital rainforests – in particular, the Leuser Ecosystem of Sumatra – are being decimated by the palm oil and illegal logging industries. Forest fires in this region are placing local communities at risk of serious health problems and driving species such as the orangutan, pygmy elephant, and Sumatran tiger to extinction. Our systematic destruction of these and other forest-based ecosystems around the world could have dire consequences for our planet’s ability to sustain life as we know it … and it is vital that we do as much as we can to prevent this today. Luckily, the public is now becoming more and more aware of the vital role that trees play in supporting our ability to thrive. The village of Piplantri, in Rajasthan, India, has implemented a practice of planting 111 new trees every time a female child is born. Meanwhile, the search engine Ecosia has used its ad revenue to help plant over 3 million trees since it was founded in December 2009. To find out more about what you can do to help save our planet’s forests, check out the posts below.